ZPMC USA is currently working on 25 cranes in nine locations that showcase a broad range of service capabilities. ZPMC USA has hired 50 new employees to support a coast-to-coast workload and its recently added parts division servicing the eastern and southern United States. Formerly known as ZPMC Crane Services, ZPMC USA has opened a warehouse in Portsmouth, Va. to complement its original parts depot in Los Angeles. ZPMC USA is the service subsidiary of ZPMC North America Inc, which is Shanghai Zhenhua Heavy Industries Co. Ltd. (ZPMC)'s operating company in North America. In 2018, the group assumed responsibility for the service associated with all of the ZPMC equipment in the U.S. and the Caribbean, as well as the parts business in the eastern and southern regions of the U.S. The company also supports installed equipment built by other manufacturers. "We're very proud of the team we have assembled, and of the work we're doing to support the ZPMC brand here in the U.S.," says Jim Anastasio, president of ZPMC USA. "We're becoming known as the resource that port operators can count on for delivery, installation and startup of new ZPMC equipment and for help with upgrades, major repairs or emergency services. Given the current trends for larger ships, we expect to be busy for the foreseeable future." Delivery and startup is a major part of ZPMC USA's current workload, with projects in five major markets on both coasts. The geography and access of each location often create interesting challenges for ZPMC personnel. At APM Terminals in Elizabeth, N.J., ZPMC USA delivered four new STS cranes and is currently engaged in commissioning and electrical work prior to startup. Delivery required the cranes to be shipped in a lowered position to pass under the Bayonne bridge. Commissioning included raising the crane to its final position. A bridge was also a factor when ZPMC USA delivered two new ZPMC STS cranes to the PhilaPort in April. This delivery again mandated the cranes be shipped with the boom girders down to the sill beams to fit under the Delaware Memorial bridge. Three months of commissioning is scheduled to continue through July. In other markets, ZPMC USA delivered two new STS cranes to Wilmington, N.C., two more to the Port of Charleston, S.C. and four to the Port of Tacoma in Tacoma, Wash. In each case, the driver behind the acquisition was positioning the port to service larger ships. Commissioning and startup work at all of these locations is scheduled to wrap up before the end of the year. ZPMC USA is also engaged in numerous crane raise and refurbishment projects at other locations. 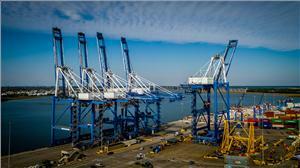 Maher Terminals in Elizabeth, N.J. has contracted the group to raise four older ZPMC STS cranes to handle mega ships. The scope of work includes performing routine maintenance while the cranes are out of service. The project began in March and should wrap up in 2019. In Charleston, the group is raising four STS cranes and upgrading the cranes with LED lighting. Two cranes have been completed and currently ZPMC is working on the third crane. ZPMC has emerged as a market leader in the crane raise process, aided by the advantage of being the original crane manufacturer with several experienced upgrade teams, and also by a specially designed jacking system. ZPMC USA's first major West Coast project involved raising 10 Terex-Noell STS cranes to accommodate mega ships at APM Terminals' Pier 400 in Los Angeles. The project, announced in May of 2016, is ongoing. Currently, ZPMC is working on the eighth crane covered by the contract. ZPMC USA is demonstrating its expertise in another category of work with an ongoing project in Freeport, Bahamas. Two named hurricanes devastated the area in 2016 and 2017, doing extensive damage to seven of the 10 cranes at the Freeport Container Port. ZPMC crews are repairing these cranes to put them back in service. The project includes structural repairs and upgrading all of the electrical drives. "Our current project portfolio shows the broad geographic representation that we've been able to achieve in the U.S. and Caribbean since our port service company launched in January of 2016," says ZPMC USA's President Jim Anastasio. "In addition to responsibility for offloading, assembly, warranty work and support for ZPMC equipment, we continue to support customers with repairs, upgrades, relocations and rollbacks for port cranes of all makes, coast-to-coast."